Light The World starts tomorrow, and I have been working all week on this Light The World Packet for Youth. I originally had thought to do just a couple of things to encourage my Young Women to participate. Then as I started creating, it just kind of took on a life of it's own. When I started working on this there wasn't a program specifically for youth, and serving with and having my own youth, I decided it was a must. 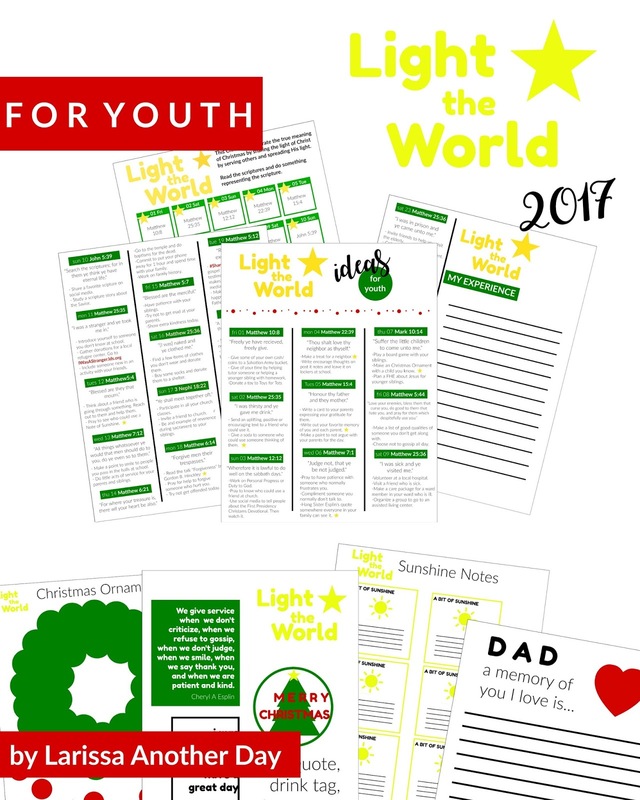 I am really happy with how this turned out and I really hope and wish that this packet is helpful to other parents, youth leaders, and youth themselves. I hope you will share it and use it. 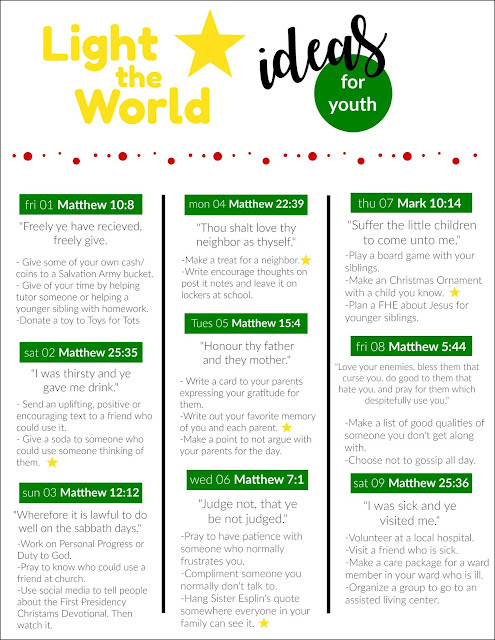 I know it is the day before and some of you might see this after Light The World has already started. The good news is that you can start at any time. 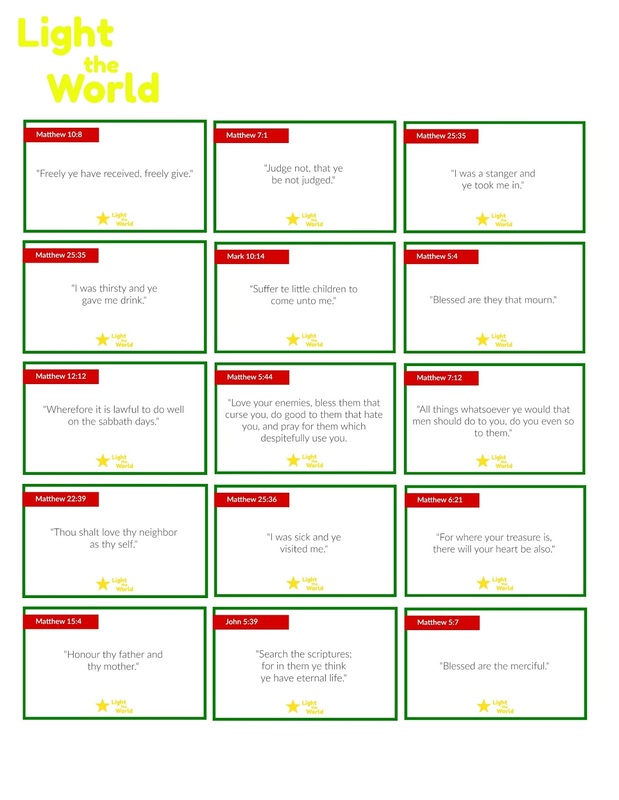 Parents: You can download and print one set and go over it with your youth. 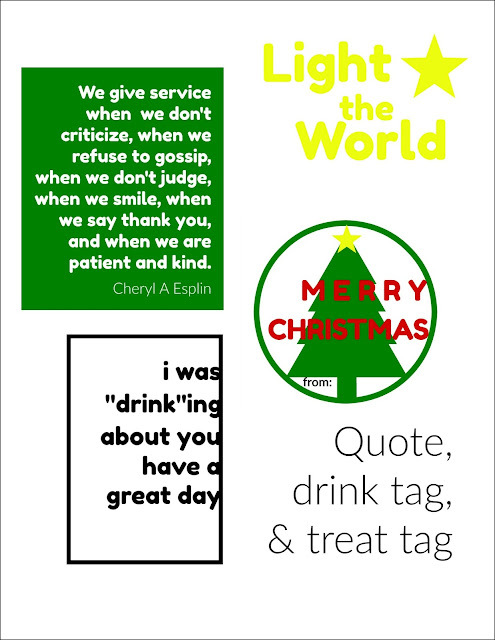 Print tags, scripture cards, and calendar on cardstock. The rest can be printed on regular paper. 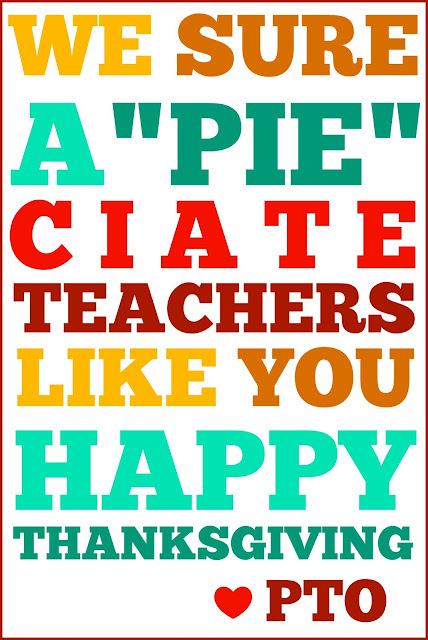 Leaders: You can download, print, and make copies. Same printing instructions as above. Assemble all the pieces in gallon resealable bags. Explain to the youth how to use it. You can even do several of the activities on the days they fall on youth nights. I really hope you enjoy this and that it helps your youth get excited about this AMAZING way to celebrate Christmas. 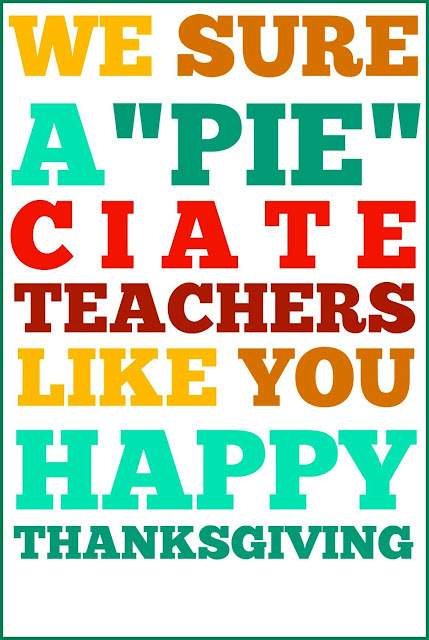 Yesterday I posted this Thanksgiving teacher mini pie gift on Instagram. I had a few people ask about how to get the tag. 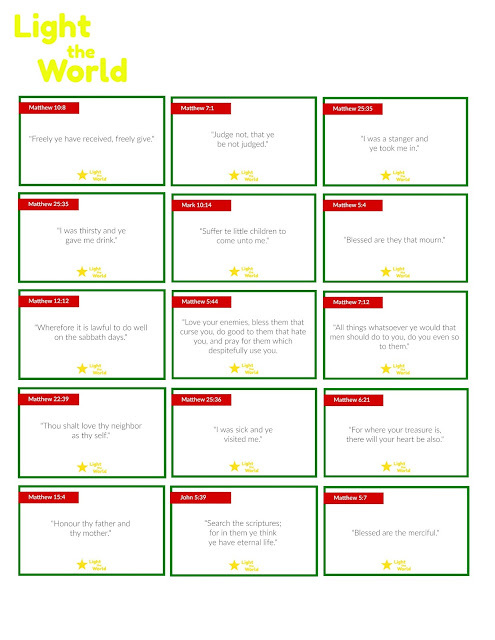 So I decided that I needed to put it on the blog so that people could get it easily. 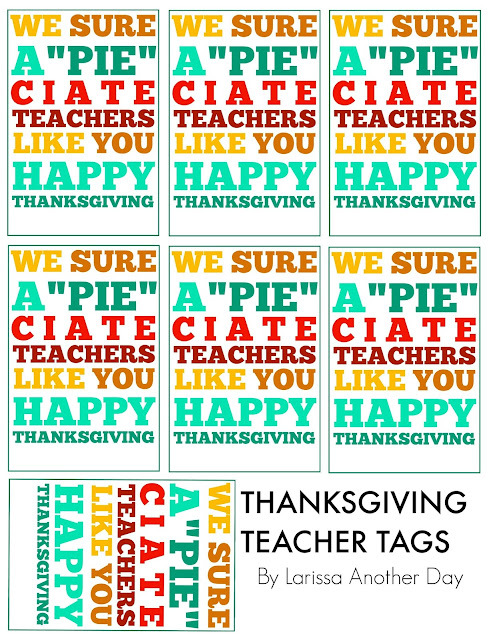 I made this "We aPIEciate You" tag in PicMonkey for our teachers. I specified it for them and the fact that the PTO was giving it to them. 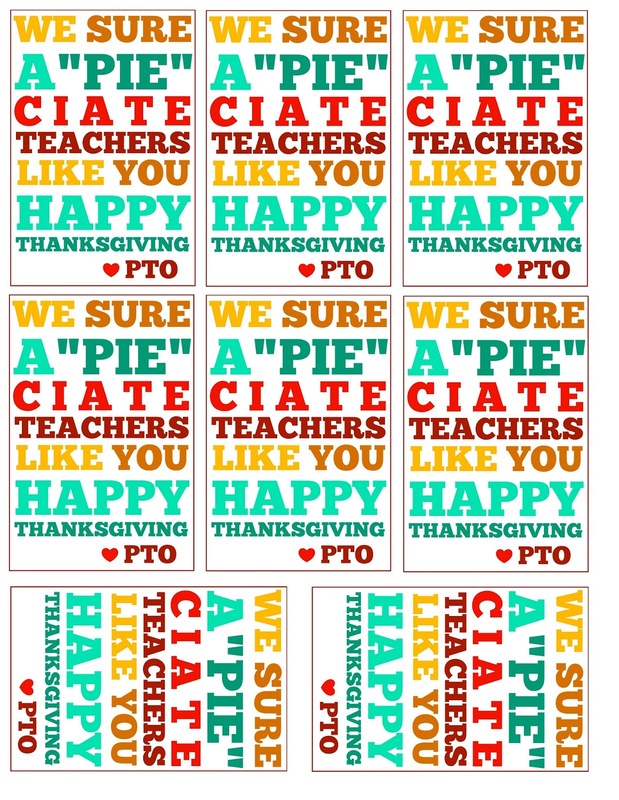 I have now made a few more generic options for those not thanking from a PTO and for those not thanking teachers specifically. 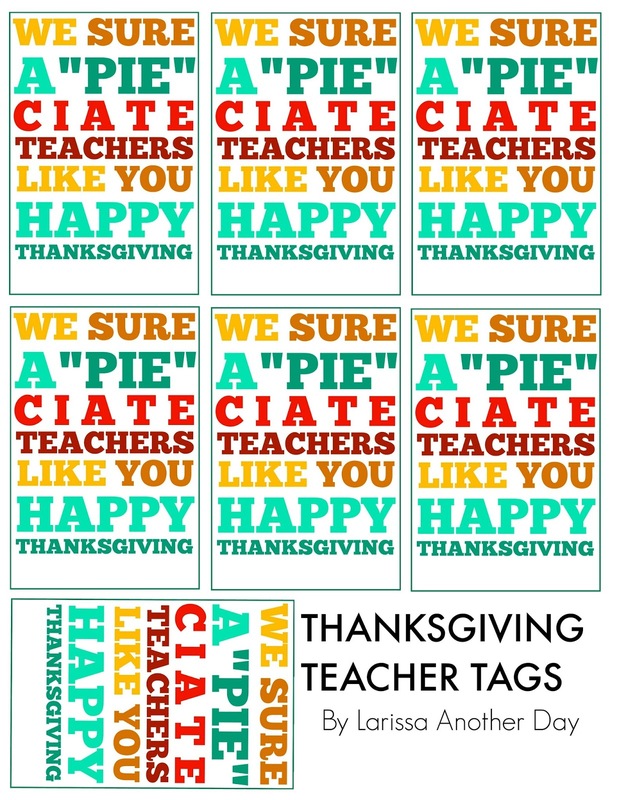 There is a single option of each tag (which you can right click and save to your computer), a sheet of the teacher tags (not from PTO), and a blank one with instructions on how to personalize it. 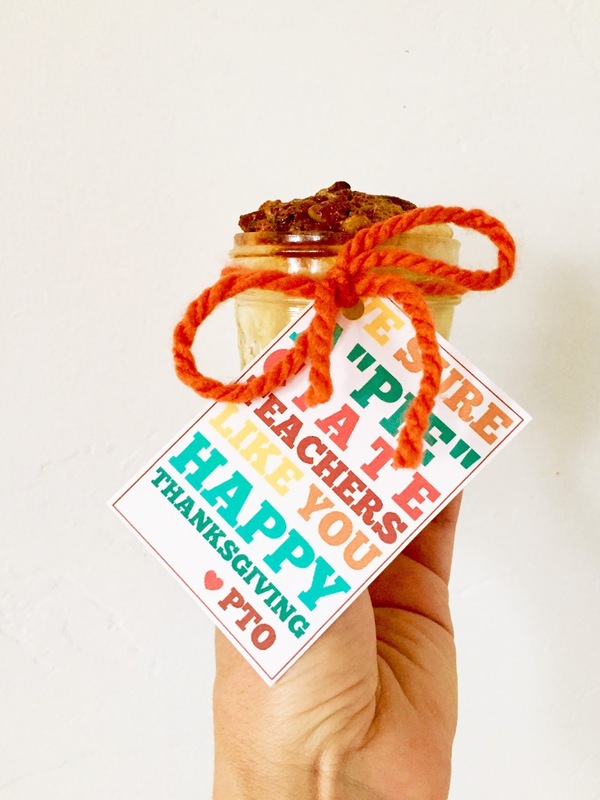 I tied each tag to a mini mason jar pie. These were pumpkin pecan made from THIS recipe. I quadrupled the recipe for the filling for 32 jars and tripled the topping. 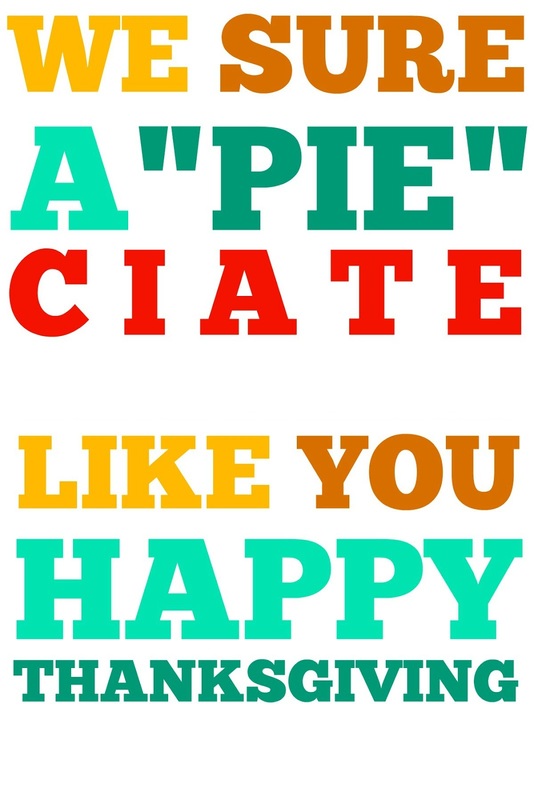 You could also attach a big ol' pie if it was for one person. 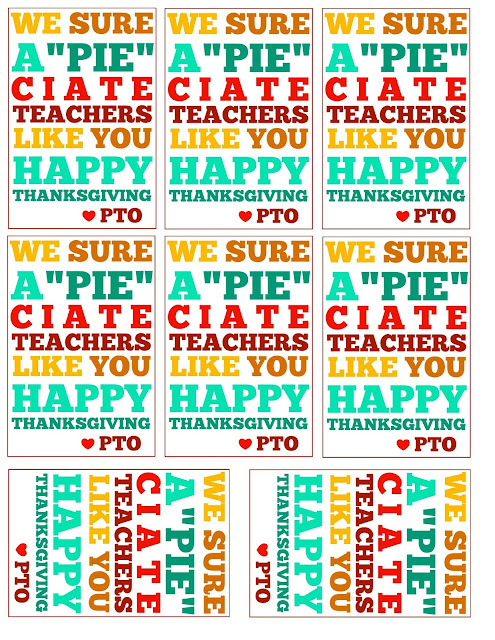 You could buy those mini wrapped pies instead of making jar pies. Possibilities are endless. Okay so for the blank one. Here is how you personalize it. 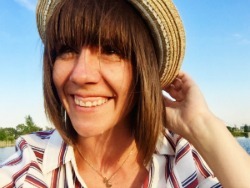 After you have downloaded the image onto your computer, go to PicMonkey. Under the edit, choose the computer icon. Then select the saved image. The font you need is Chunk Five. Add Text. Make the word of the person you are thanking fit. Also make sure your caps are on. Add spaces or increase the text size to fit the space. Change the color to 8e0500 in the text edit box. If you want to add a from, then type the text you want and adjust color and size. Then you can save and print it off. Woot. Hope that make sense and that this makes thanking a teacher for Thansgiving easy peasy! 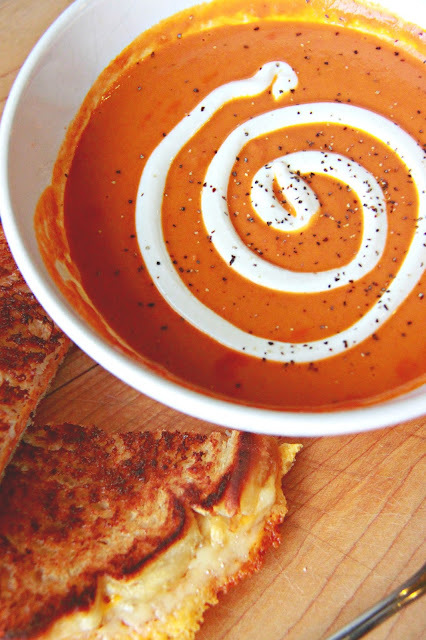 Tomato soup is almost always a crowd favorite. 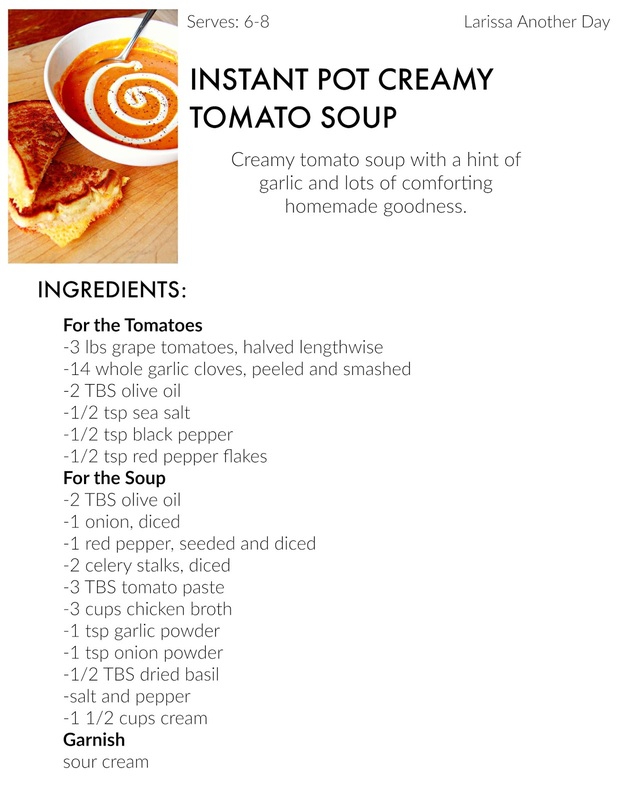 Making homemade tomato soup in the past has been a challenge, producing less than delicious results. I had made this ONE with grilled cheese croutons which I liked, but my kids still preferred the can version. So I had given up of finding something to replace the quintessential tomato soup from the can. You know the soup. The kind we all loved as children, and still secretly love as adults. A few weeks ago I got the hankerin' not for chili as the typed accent would allude, but for homemade tomato soup. I was a little cautious about trying to make some because of the aforementioned soup disasters. After some searching, and a little self pep-talking, I found a recipe that I thought would be successful. This recipe called for roasting tomatoes instead of using the canned ones. I thought that was a good start since all the previous recipes I have tried used the canned ones. I had posted on Instagram about the smell of the roasting tomatoes and garlic. Gosh it was ever so delightful. From that smell alone I was hopeful. Roasting the tomatoes and garlic is the "hardest" part and really it was nothing. The soup came together easily and I only made a few alterations from the original recipe. The use of an immersion blender (best thing ever) made this soup so smooth. 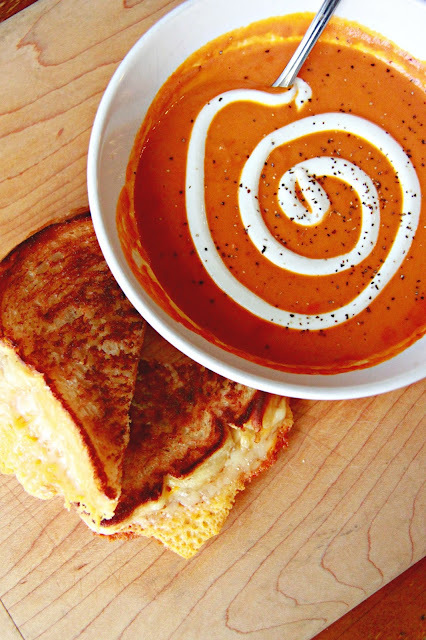 In our house, it is normal for us to top our tomato soup with a little bit of sour cream. The fancy swirly depicted was just for you, normally we just drop a large dollop smack in the middle. 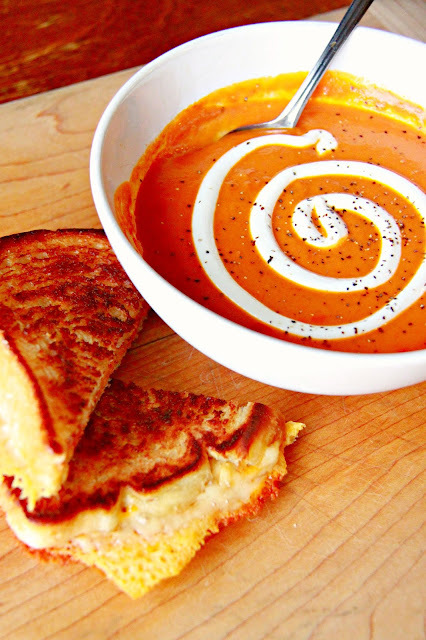 Another tomato soup staple...well the grilled cheese sandwich of course. 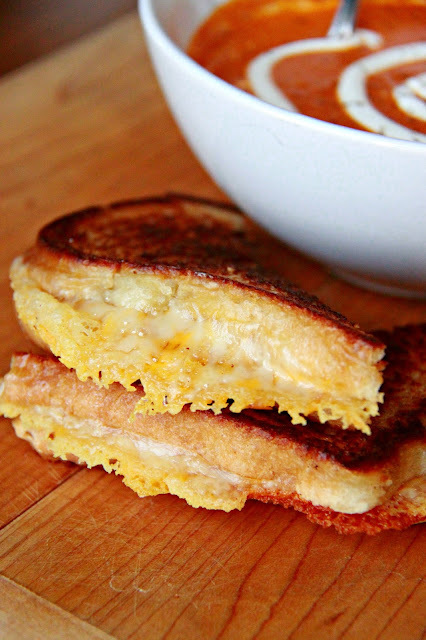 A few months ago we had these amazing grilled cheese sandwiches at our local farmer's market. They were DIVINE. In fact, they were so divine that we followed them up to another farmer's market a few hours away. Kidding. We were already planning on being there and they just happened to be there too. We like to think it was divine intervention. Anyway. I noticed something about how they made there sandwiches. They grilled the bread and cheese separate at first. Big piles of ooey gooey cheese melted all by itself and then was added to the grilled bread before letting it cook a little more. So I tried it. It was life-changing and I will probably only be making them this way from now on. But this post isn't about grilled cheese sandwiches. I digress. 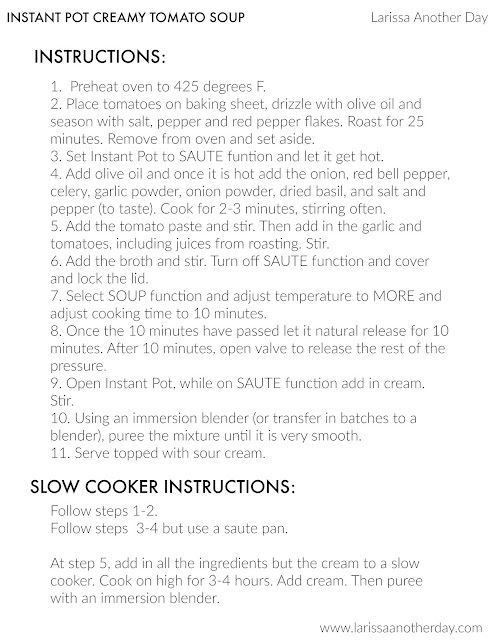 You should give this soup a go. Seriously. If you don't have an Instant Pot, no worries you can make it in a crock pot too. I will put those directions too. Okay guys, so let me explain this recipe "card" situation. Bear with me for just a bit longer. I have made these recipe print offs. I admittedly do this the hard way. There are not recipe widgets in blogger (yes I know I should switch to wordpress, but since I am not sure how much I am going to blog again I don't want to switch). Because of this I have to create my own recipe template. I had one I was using, but I wanted to switch it up so I created this layout using PicMonkey of course. The image is going to be in the post and then there will be a print option. For short recipes, there will be one page. For longer ones, two. I know it isn't as fancy as a widget, but I think it will work nonetheless for either printing or screen shotting (since that is what a lot of us do anyway).